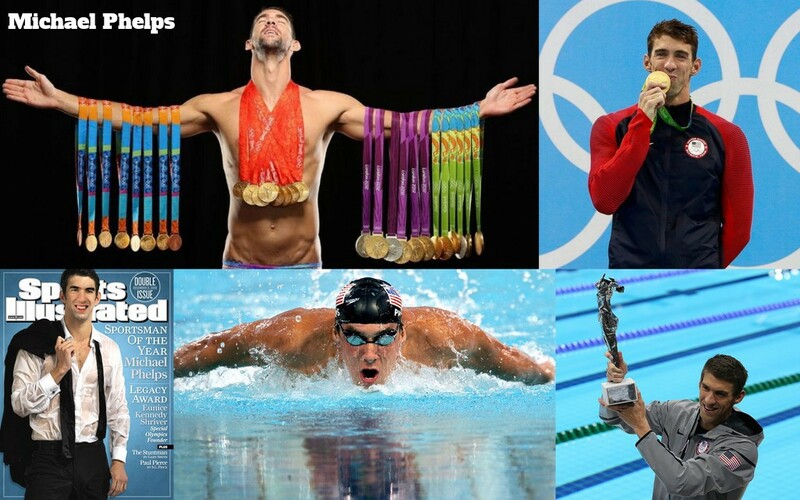 🏊 Michael Phelps - The Greatest Swimmer and most decorated Olympian of all Time! Michael Fred Phelps (born June 30, 1985) is the most celebrated athlete and the most decorated Olympian ever in the history of the sports. Phelps has created a whopping 39 world records, 29 in individuals events and 11 in group, to become the only swimmer ever to do so. Nicknamed "The Baltimore Bullet” and “Flying Fish” the man created ripples in water at a tender age, he became the youngest player in 68 years to represent America in the Olympics and is now considered the greatest swimmer of all time. Phelps also holds the all-time records for most number of Olympic Gold Medals (23), Olympic Gold Medals in individual events (13) & Olympic medals in individual events (16). When he won 8 gold medals at the 2008 Beijing Games, Phelps broke fellow American swimmer Mark Spitz’s 1972 record of 7 gold finishes at any single Olympic Games. He is a long course world record holder in the men’s 100, 200 and 400 meter Butterfly. He has won 82 medals in major international long course competition, of which 65 are gold, 14 silver, and 3 bronze. Phelps’s international titles and record-breaking performances have earned him the World Swimmer of the Year Award 8 times, American Swimmer of the Year Award for 11 times and the FINA Swimmer of the Year Award in 2012 & 2016. He holds 26 Guinness World Record which predominantly is the most number of records for total number of accomplishments and victories in swimming. Phelps grueling training regimen saw him spend 6 hours a day, 7 days a week, 365 days a year, for almost two decades. He never once missed a day of practice, unless injured. Michael Phelps is truly a phenomenal athlete and one of the best swimmers that the world has ever seen.